Mark your calendar for a stupendous journey around the world of wines at the Sykesville Art & Wine Festival, on Sunday May 5th, 12 to 5pm! This year, the Downtown Sykesville Connection (DSC) is not only showcasing some of the best Maryland wineries, the DSC is also bringing to downtown Sykesville over 50 vineyards from the Sonoma Valley, Argentina, France and Italy. Whites, reds and rosés, sangrias, wines, cavas and other specialty wines will be available for unlimited sampling with your collectible Sykesville glass. Pre-sale tickets are available for purchase now for $35! Tickets will be available at the door on the event day for $40. The 2019 wine sampling is as exciting and diverse as our live entertainment, local artists, and food trucks display! Three different music venues, street performers and tons of local artists will await you in downtown Sykesville. The event also showcases the local business community, embodying an atmosphere of old-fashioned, historic, small town charm. This Festival is presented to you by the Carroll Community Bank – a long time DSC and community partner – with the support of two locally owned small businesses – Granite Pro LLC and Assist-2-Sell. Do you want to join a super fun group of volunteers and help make this festival the best yet? Please sign up using the link below or email us at DowntownSykesvilleConnection@gmail.com to come join as group and represent your cause at one of our tents. The Downtown Sykesville Connection, the Town of Sykesville and The Carroll County Chamber of Commerce look forward to seeing you on Main Street on May 5th! Non-refundable, event is rain or shine. *Information provided to the Downtown Sykesville Connection will not be used for any purpose other than the distribution and/or confirmation of receipt of tickets. *The Downtown Sykesville Connection is not responsible for any situations that arise due to the Paypal transaction system. 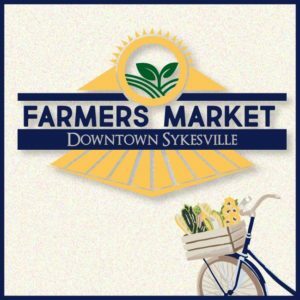 The Sykesville Farmers Market runs every Sunday, 9:00am-1:00pm from May 19th to Oct 27th! You can find a variety of fruits and vegetables, herbs, honey, cakes, nuts, beef, pork, poultry, eggs, cheese, baked goods, dog treats, jewelry, pickles, wine, and more. We have the Junior Market returning that is entirely operated by the kids! Every Sunday we will have a guest Non-Profit group joining us to connect with our community (Stay tuned as the guest non-profit will be announced on our Facebook page every week!). The Little Sykes railway will be running from 9am-1pm. Did we mention we have a moon bounce and kids games (hula hoops, chalk, and jump ropes…) always available for free at the market from 9am-1pm?! Appearances in the news, upcoming initiatives, how the community connects on Main Street, and so much more is happening. Find out what's up right here.